The girls varsity basketball team boxing out and defending the paint hard in practice as they prepare for the Lancers of L'Anse Cruise on December 4th. The snow has already started to fall in the city of Fraser, and that can only mean that its almost time for the winter sports season. Its almost time for big time baskets from both basketball teams, rumbling and tumbling of the competitive cheer squad, going at it on matts in wresting and the boys swim team making a splash. Before all the fun begins, heres a preview on what to expect from each team this season. Girls Basketball- The girls team last season, had a strong start to the beginning of the year winning their fist three games then ran into the powerhouse of Lakeview High School and fell to them at home 41-30. After losing to Romeo the next game, the team would win nine out of the next eleven games. The girls team would ultimately make the it to the district final losing to Cousino High. With the departure of five seniors and three of them being starters, the girls team has some shoes to fill at key positions. 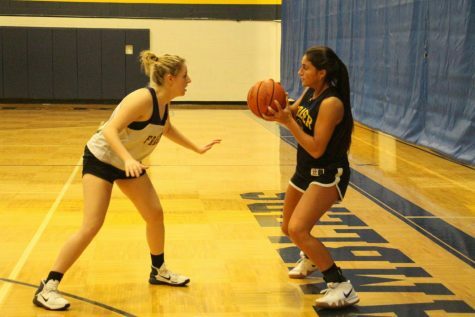 Senior Maria Lalama, white, defends senior Bella Grillo, blue, during a team drill in practice on November 26th, 2018. Luckily with a big junior class returning as seniors this season, expect the same or even better record than the year before. With seniors Elsie Vitale, Bella Grillo, Sarah Schronack, Samantha Tanner, Tiffani Torres, Maria Lalama and Madison Salah leading the charge, the rest of the Macomb Area Conference better be on the look-out as the girls season opens at home against L’Anse Cruise on December 4th. Boys Swimming- After winning the MAC White division last season, the boys swim team has seen some key figures walk out the door. With head coach Robert Ogilviy retiring, two time state champion swimmer Alexander Capizzo also left the team to train at a higher level, and the big senior class from the previous season is also gone. With the addition of a brand new swimming pool and with new head and with big group of seniors such Danny Chandler, Ryan Allor, Luke Roberts and Adam Ferzo leading a young team to what hopes to be a another divisional championship. Their quest for another title begins with a tough matchup on the road against Anchor Bay on December 11th. Boys Wrestling- After winning their fifth straight divisional championship, the boys wrestling team looks again to win the programs sixth consecutive title in a row. With key seniors leaving the door opens now for a new and bigger role from this years seniors. The ramblers look unstoppable on the matts and will continue to keep finding a way to this season. Look for the same result from this program this season. The boys wrestling season begins on January 10th of 2019 as they host Lamphere. Boys Basketball- After a disappointing 2017-18 campaign, the boys basketball team looks to shoot their way back into the competition this season. After winning only six games and losing thirteen and having a stretch of losing ten out of twelve this team has a lot of hope going into the new year. With key seniors leaving such as Brendan Gordly, Ian Cassy, Matt Lockhart Jr, and few others, there are a whole lot of shoes to fill on this team. With key play makers returning such as Micheal Peniccia, Eric Higgins, Thomas McNellis and Tai Davis expect a bounce back with this team as they open the season on November 27th as they host Eastpointe. Competitive Cheer- After a disappointing season last winter, the girls competitive cheerleading team will look to tumble back into the competition in the MAC White division. The girls first meet will be on December 12th as they head out to Marine City High School as they will take on multiple schools in a multi-school meet.